Outside the front of Alpine Lodge. 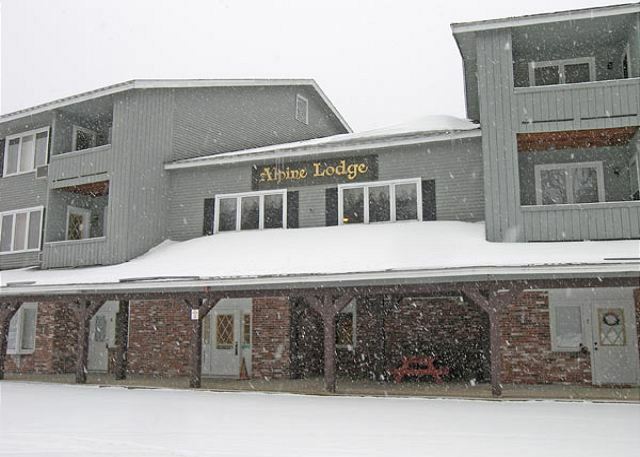 Alpine Lodge 118 is more easily accessed by the rear entry. 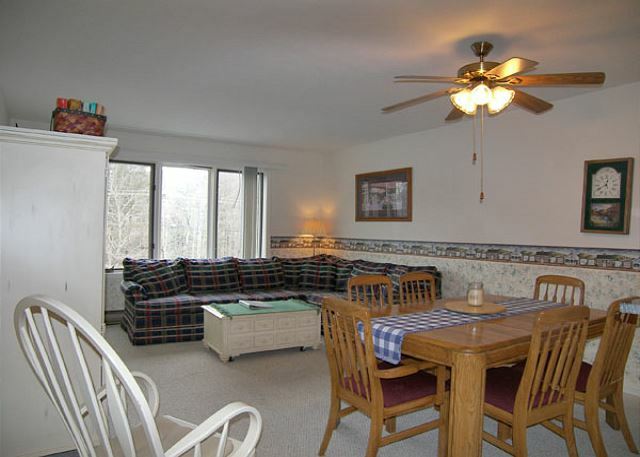 This cozy single-level one bedroom condominium is easily accessible from the back entry to the Alpine Lodge building. 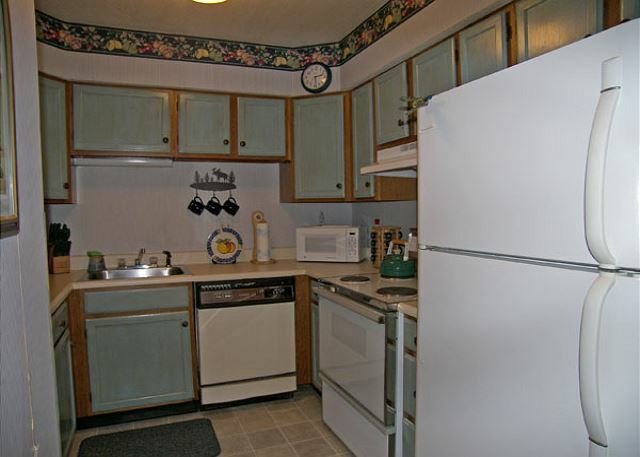 Enter the condo to a short entry hall with the kitchen on your right. 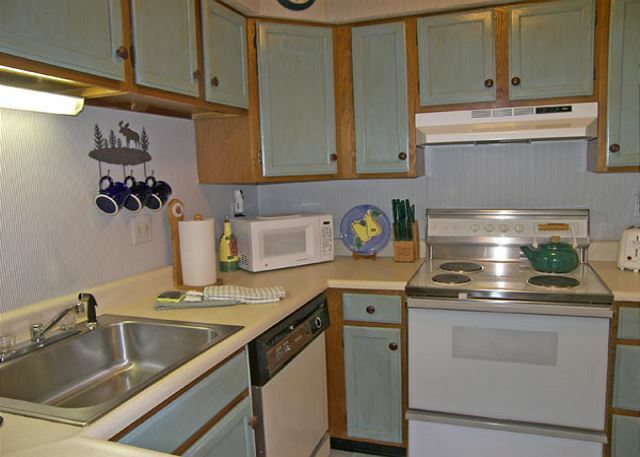 This full kitchen offers a microwave, dishwasher and electric stove with self-clean oven. Travel beyond the kitchen to the open-concept dining and living area. 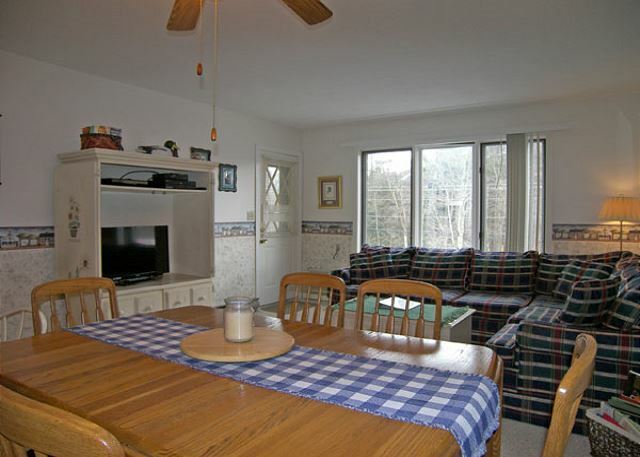 The dining area offers a great table for meals and games with seating for six. The living area has a spacious wrap-around sofa (with sleep sofa section), flat screen TV with DVD/VHS and air conditioning. Off the living room area is access to the small front deck, perfect for sitting out on a summer night with your favorite book. 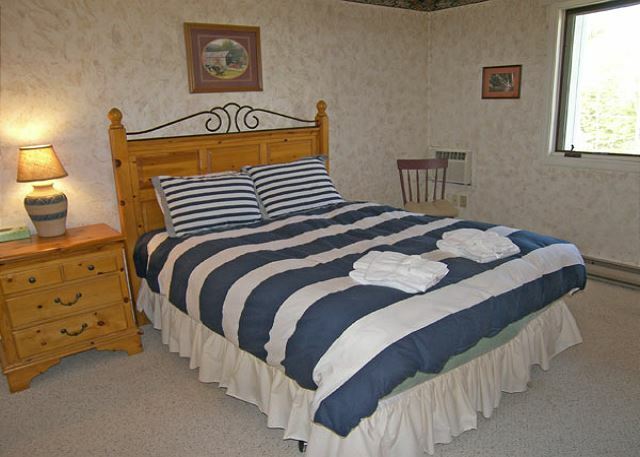 Located to the left off the entry hall is the full bathroom and master bedroom. 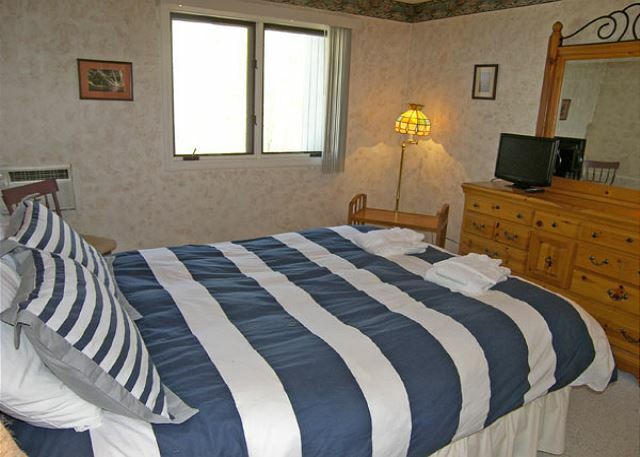 The master bedroom has a queen bed, television and air conditioning. Sorry, there is no grilling allowed on Lodge building decks. *Dogs are welcome, $25 fee per dog. No more than two dogs allowed. Nice unit in lovely Woodstock. Easy walk to the river, shops. Comfortable and clean. Alas, no cross ventilation and right on the street. If you check in late, property management requires you to drive out again in the morning to sign forms you could have signed well in advance. Especially for repeat customers, this is an inconvenience. Couldn't have been better. Exactly what we needed. 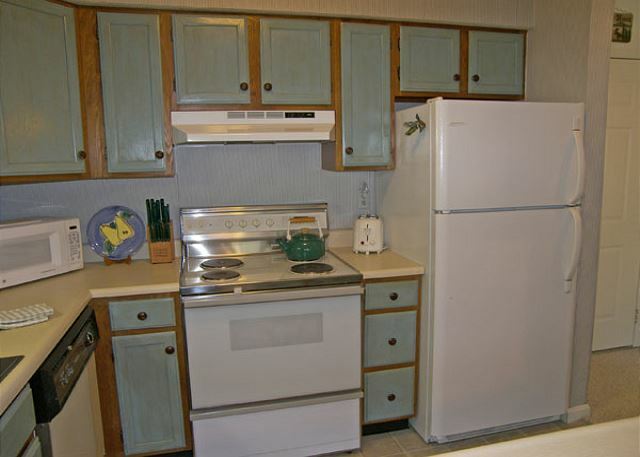 As with previous rental reviews for this property, the smell of smoke in the hallway noticed by myself and all 3 of my children, makes it difficult to want to return and recommend a very nice and comfortable condo. 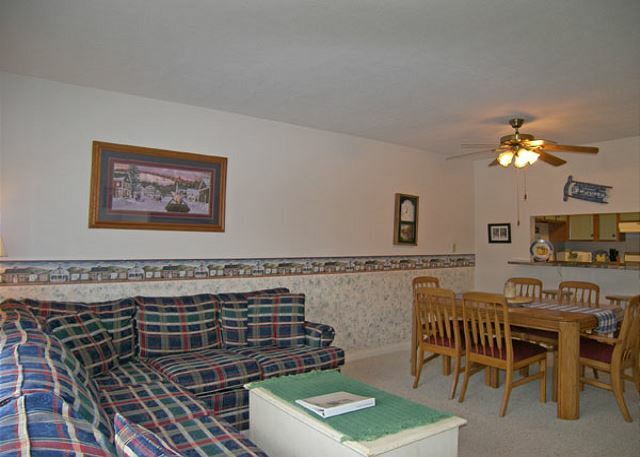 We're happy that you found the condo itself to be clean and comfortable. 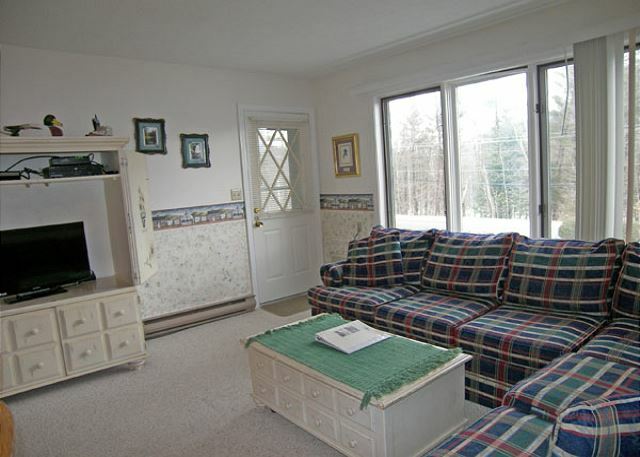 a guest from Greenwich, CT does not recommend this vacation rental. The property itself was fine, a little dated. Bed was comfortable, bathroom clean. Finding the unit itself was a bit of a challenge with a back entrance. The property was accessed from inside the building. In the hallway, there was a pervasive cigarette smoke odor. We're glad you found the actual condo fine, clean and comfortable, and will check with the association to see if there is anything that can be done about the common area odor. Thank you for letting us know! The condo association has told the neighbor that they are only allowed to smoke outside, so that should alleviate this issue in the future.